WW II had a personal impact on virtually everyone. From French housewives, English businessmen, German Jews and even Glenn Miller, the impact was felt by most people in one way or another. For military troops, regardless of affiliation, that meant fighting with the best tools they had available and for most of them, the main tool they had was their pistol. While the average person directly involved in one battle or another, any weapon they could bring to bear was used. For the military, reliance on the armament they were issued, or they could acquire on the battlefield was paramount. World War II soldiers needed pistols/handguns that worked reliably, they could locate ammunition for and was plentiful enough they could swap parts if needed. Beretta 1934 & 1935 - Compact pistol used by the Italians. Was adopted before WWII and became standard service issue. Browning High Power - Originally used by many countries during WWI and WWII, was mostly used by the Germans for the occupation forces. Inglis High Power - Canadioan re-engineering of the Browning High Power for Allied forces. 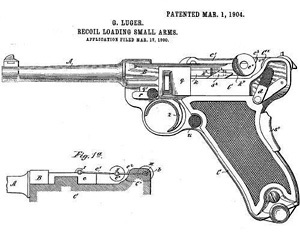 Luger P08 - This was the standard German side arm starting in 1908. 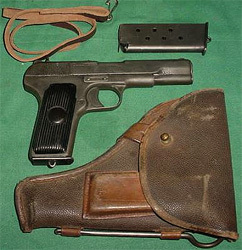 Seeing service through both WWI and WWII, production was discontinued in 1942, although many german troops and officers were issued the Luger P08 throughout the war. Colt M1911A1 - Originally designed by Browning in 1911, it became the standard military issue service weapon for virtually every branch of the U.S. military. This ubiquitous gun, still in manufacture by many companies today, was still standard service issue until the late 1980's, although its usage throughout the U.S. military is still popular today. M1942 FP-45 Liberator - This single shot gun was designed as the WWII version of the "zip gun". It was simply designed, cheaply made and was designed to be dropped into occupied territories, manly France, to give resistance forces a weapon they could use to capture a better one. Walther P38, HP, PP and PPK - Series of German pistols in use throughout WWII. 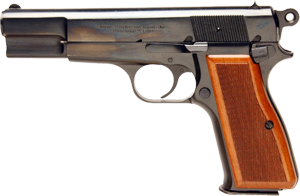 The P38 was designed to, and replaced the Luger P08 in 1942 and the HP was a commercial version of the P38. The Walther PP was designed for police service and also served quite often as the military sidearm for German troops. The PPK was designed for covert operations and was a shortened version of the PP. While there were many other pistols in use during WWII, these were the most popular used around the world during various battles, campaigns and conflicts. Many of these guns, especially the Luger, Broomhandle Mauser, M1911A1, the Nambus and the Walthers are very collectible weapons and, if numbers match, especially the magazine, can fetch a premium price at auctions and gun shows. Thanks to U.S. troops sending home captured weapons from the battlefield, many of these collectibles are actually available in the U.S. today.